I just found out about a great tool for those of you that want to follow the path that we’re taking on this expedition. 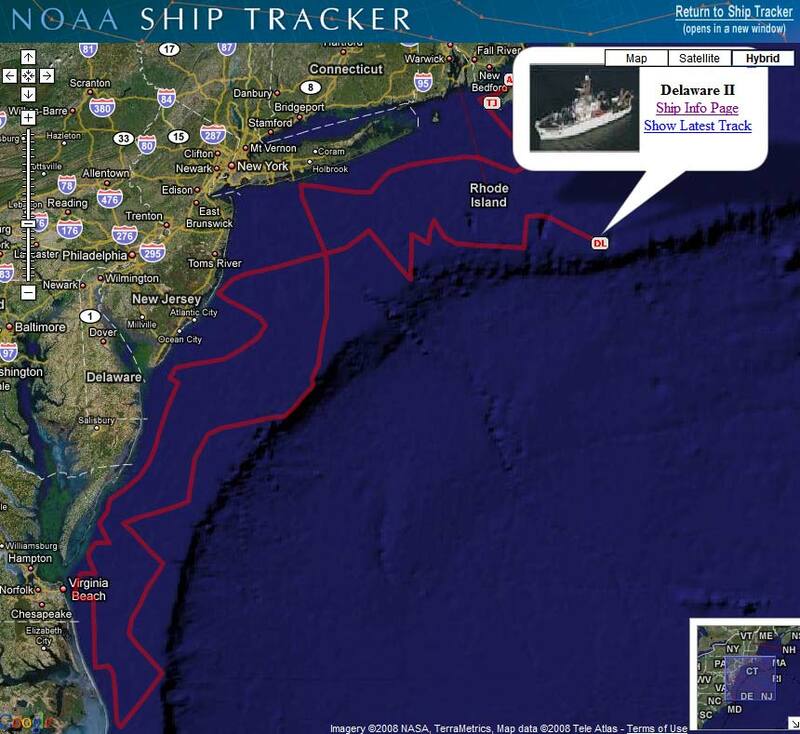 Go to http://shiptracker.noaa.gov/ , choose Oscar Dyson (DY), and the resulting map will show you where we’ve been, as well as our current location. 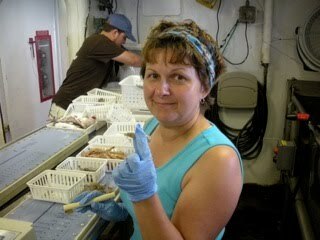 Here I am getting ready to enter data about one of the MANY shrimp that I have seen over the past few days. This was the first night (day) that I actually slept straight thru. 8 hours of sleep has never felt so good!The scientist aboard the Oregon II have a very important job to do and they work very hard. Sometimes when people think of scientist they think of a nice clean lab with everyone wearing white coats. Not the case here! It not uncommon to be shoveling fish into buckets. 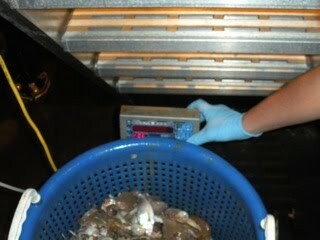 Here is a photo of a bucket of organisms that are being measured. Our ship’s tracker has not been updated since we left Galveston so if you see we are still there, we are not. Hopefully it will be updated soon. Well, I do have to go because my shift started 35 minutes ago and there are things to do. I will try to remember to take photos tonight. We collected a sea horse yesterday, but I didn’t get to take my photo before it was discarded, I was out doing a titration. We are heading east out to sea, right now at 4005 N latitude, 6942 W longitude. (Pull out those atlases). We will begin a turn north towards Georges Bank. 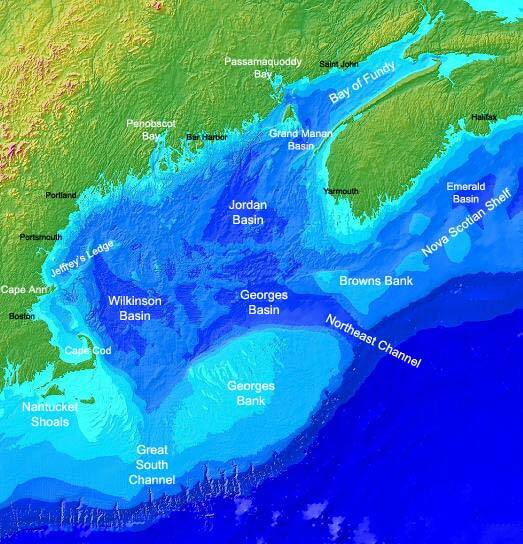 Georges Bank is a large elevated area of the sea floor which separates the Gulf of Maine from the Atlantic Ocean and is situated between Cape Cod, Massachusetts and Cape Sable Island, Nova Scotia. Georges Bank is (was) one of the most productive North Atlantic fisheries (Grand Banks being the most productive). “Legend has it that the first European sailors found cod so abundant that they could be scooped out of the water in baskets. Until the last decades of this century these banks were one of the world’s richest fishing grounds… (Source: AMNH web site below). This map shows the location of Georges Bank and the underwater topography. Northeastern fishery landings are valued at approximately $800 million dockside, of which a large proportion is produced on Georges Bank. Recently, scientists of the U.S. Geological Survey (USGS) and NOAA’s National Marine Fisheries Service (NMFS) have undertaken an effort to document direct interactions between physical environmental factors and the abundance and distribution of fishery species. (Source: USGS below). This means that the water chemistry, temperature and other factors affect how many fish there are, how many kinds of fish there are, and where they are. The article from USGS explains that the sea floor sediments that form Georges Bank came from the time when glaciers scoured the area. Since that time, sea level has risen, covering the glacial sediments, and tides and currents are eroding the bottom. When this erosion happens, small sediment particles are winnowed out by tides and currents leaving larger gravel-sized sediments on the floor. This kind of surface is good for scallop larvae and other small animals so they can settle on the bottom and not get buried by sand. Thus, the type of sediment on the ocean floor helps determine what kinds of animals can live there. This map shows the continental U.S. 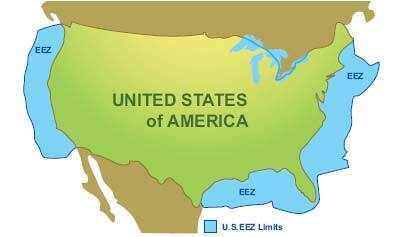 Exclusive Economic Zones (EEZs). Interestingly enough, politics and international relations have affected our trip to Georges Bank. We have been waiting for clearance through the U.S. State Department working with the Canadian government, to get permission to go into Canadian waters. As Wikipedia explains below, part of Georges Bank is “owned” by the U.S. and part is “owned” by Canada. Our route is to take us through the eastern part of Georges Bank, the part owned by Canada. Unfortunately, due to the speed of processing the request, we just this morning found out we got clearance to go there. If the request had been denied, we would have had to sail around the Exclusive Economic Zone (EEZ) to avoid Canadian waters. Fortunately, we are now good to go. “During the 1960s and 1970s, oil exploration companies determined that the seafloor beneath Georges Bank possesses untold petroleum reserves. However, both Canada and the United States agreed to a moratorium on exploration and production activities in lieu of conservation of its waters for the fisheries. USGS http://pubs.usgs.gov/fs/georges-bank/ (more difficult to read) The map above is also from the USGS website. It’s been a very quiet day today. We had several station samples this morning. At the first one, around 6:30 a.m. one of the crew members spotted two whales. They were too far away to see what kind they were. I, unfortunately, was inside the ship at that time and missed it. However, we are heading north so maybe we will have a chance to see some.